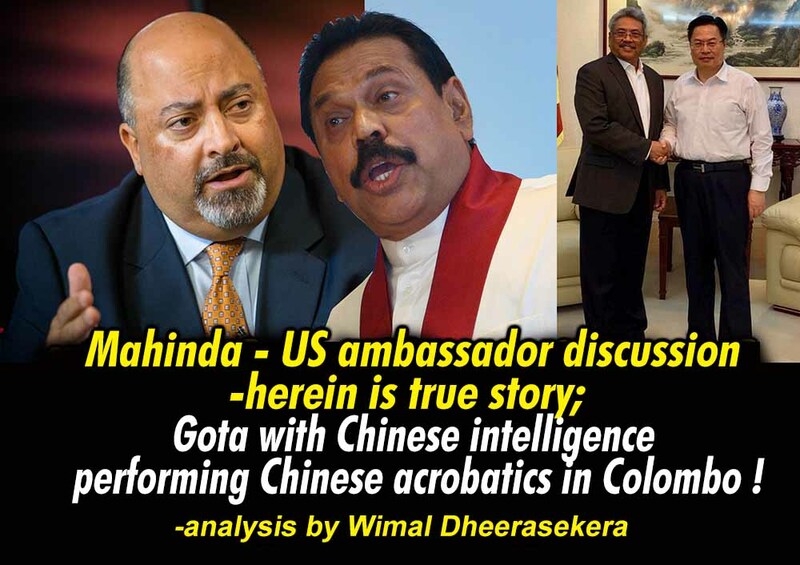 LEN - www.lankaenews.com | Mahinda-US ambassador discussion -herein is true story; Gota with Chinese intelligence performing Chinese acrobatics in Colombo ! (Lanka e News -15.June.2018, 10.30PM) The media report that there was a discussion between the US Ambassador in SL and Mahinda Rajapakse regarding the American citizenship of Gotabaya and his fielding as a candidate for the presidential election is mendacious , according to reports reaching Lanka e News. The media that is pro Rajapakse primarily reported that America does not accept Gotabaya contesting as presidential candidate , neither his appointment as president , and it is bitterly opposed to that . It also revealed the US Ambassador Athul Keshap told Mahinda not to field Gota as presidential candidate. This meeting was the first Mahinda had with Keshap after the former was thrown out lock , stock and barrel by the people at last elections. That is when Keshap was about to leave the country at the end of his contractual period. What truly transpired during the discussion between Mahinda and US ambassador…. Based on the report of the Embassy received by Lanka e News , what was discussed was something different .Mahinda had requested US ambassador Keshap to expeditiously take a decision in regard to the application made by Gota to cancel his US citizenship. Keshap has replied that task is outside his purview . However as he is readying to leave SL ,he has told Mahinda to make a request to his successor who will be coming here. Nothing beyond on Gota ‘s issue had been discussed .. In any case Gotabaya hasn’t so far fulfilled the basic requirement that if he is to contest presidential or parliamentary election he cannot have citizenship of another country or a dual citizenship. Notorious liar Gammanpila who holds the ignominious distinction of having never won a case as a lawyer and who roams the streets touting for clients , and better known as an accused appearing more frequently on the dock in court and less frequently on behalf of clients , convening a media briefing blabbered , because Gota has submitted an application to rescind his US citizenship , that would suffice for him to contest elections in SL. Gota once told the media , that after visiting the US Embassy and making an application to cancel the US citizenship , within two weeks the decision can be secured. But now , Mahinda the elder brother has requested the US Embassy to expedite Gota’s visa application which has taken several months to process. America accepts dual citizenship in relation to Israel only , and not any other country . Gotabaya has a basic US citizenship .It is only in SL his dual citizenship is accepted. US of course does not accept such a thing. If citizenship is to be terminated while being in America that will not be permitted. The request can only be made from an outside country. If any citizen makes a request to withdraw his basic citizenship , an extensive investigation is conducted in that regard. The main reason for this is the concern when the citizen of that country loses his/her citizenship whether he /she will become stateless and thereby insecure. The US government specially focuses on , whether the citizen is trying to escape from the arms of the law by withdrawing his citizenship. Say , if there is a divorce suit , cancellation of citizenship will be disallowed. Already , the Tamil Diaspora and the organization have filed several cases in various states against US citizen Gotabaya that he is responsible for the war crimes committed in SL . In addition , special advisor Ryan Goodman who special counsel to the general counsel of the US Department of Defense had forwarded a detailed report to the US Congress fastening the blame on Gotabaya for the war crimes in SL. This being most serious, it is only a fool will think Gotabaya will be granted his request in a fortnight putting aside all those grave incriminations . According to the explanation offered by the US State lawyer , the ‘Lawyer always in the dock’ Gammanpila’s lop sided interpretation should be dismissed as a joke with the contempt it merits. It must be probed whether the US has developed a friendly attitude to Gota who is its own citizen. Gota being a US citizen , US is aware by making him the SL president it can use him . Then why is US reluctant to make this move ? It is Gotabaya who overturned this favorable situation .End of last year , the PLA National Defense University , Beijing invited Gota and gave him special in house training for about a month. The Beijing National Defense University which was in the Chinese Peoples Red Army military academy and the political academy were amalgamated , and in the first half of the nineties it was made the apex Chinese Institution which trained military and political leaders. In short it was an Institution where rejects were polished. Gota was given lodging for about a month in that Institution and while obliterating all his shortcomings he was brainwashed during training. If Gota’s conduct in the recent past is analyzed one can understand what is the training he has undergone. Moron Gota who behaved differently during the BBC interview then is now a better dressed and more deceptive but captivating Gota before the media . 2 Chinese intelligence officers with Chinese money in Colombo..
China did not stop at that. Already two Chinese intelligence division officers have been sent to Colombo to render assistance to Gota.Though we have even the names of these two officers , we believe this is not the time to reveal them . Moreover China is pumping enough and more funds to Gota . In order to make things easy , China has sent an ambassador to Sri Lanka who is a confirmed Chinese political stooge , which action no other country would resort to. China usually when appointing ambassadors selects officers of its foreign service trained in that sphere ,and does not make political appointments . But the present Chinese ambassador in SL is not such an officer . He is a communist party political figure. Today , websites are being launched , Tabloid newspapers are being started , organizations are being commenced under various names to make Gota the president, but all these are out of funds pumped in by China. Gota who is gazing at America, is somersaulting elsewhere and performing Chinese circus acrobatics in SL. America which is for India and appearing on behalf of India within the zone , has not only been most cautiously watching the somersaults of Gota and his circus performance , but is even watching now. In the circumstances, it is only a political ignoramus who would assume the US citizenship which is a stumbling block to Gotabaya ‘s becoming the president will be cancelled by the US officials even in two years, let alone two weeks. An officer of the diplomatic division of the US Embassy in Colombo revealed to a journalist , cancellation of Gota’s citizenship may take three months or three years . Gota and his lawyers have by now understood the true picture .Hence , they are seeking other dubious and devious methods to circumvent the SL law. They are trying to use the president who is eating from the same plate with Gota secretly , to file a petition in the Supreme court requesting an interpretation on the legal clause which bars those with dual citizenship from contesting elections. It has been planned to enlist the pro Rajapakse stooges , namely judges Eva Wanasundara , Priyantha Jayawardena and Buwaneka Aluvihara and secure an interpretation of the law favorable to Gota. For any reason , if the president is averse to this , another ploy has also been devised. There are only two ways by which interpretations can be had on constitutional clauses. One , by the president asking for an interpretation from the SC . The other is , in another case that is being heard in a court , that court can request an interpretation from SC in regard to an ambiguous clause which is in conflict with the constitution . In case president who is already embattled and most despised supports Gota to find an escape route , he is certainly going to incur the wrath of the people. Hence he may keep himself out of it. Gota who has realized this possibility has enlisted the lawyers to implement his second plan. When a petition is filed in the appeal court to examine the clause that prohibits a dual citizen from contesting elections , the appeal court will have to request the SC for an interpretation on it. It is their hope that would open the escape route for Gota via that ploy. No matter what , in conclusion what needs to be said is , as regards the appointment of a presidential candidate , more than the good governance government it is the pro Rajapakse opposition which is in a deep quandary. This is because they can never think of winning presidential elections except by fielding a Rajapakse. Moreover , irrespective of whatever divisions or differences that may exist and whoever the Rajapakse may be , after seizing power , the Rajapakses will as sure as the sun rising in the East always, will join together to form a family regime to commit plunder and murder again.